This is our version of the classic American Key Lime Pie, which traditionally uses limes from the Florida Keys and has a crumbly biscuit base. Don’t worry, though – you can use any kind of lime for our easy Key Lime Pie recipe! Sweet and delicious, this is a great simple dessert to delight your guests. The sweetness of Carnation Condensed Milk balanced with zingy limes is sure to tempt the taste buds! 20x30cm rectangular loose-bottomed tart tin or 23cm (9in) round loose-bottomed tart tin. 1. Mix the crushed biscuits with the melted baking spread in a bowl. 2. Tip the biscuit into your tin, pressing it into the base and up the sides. (This will be the base of your Key Lime Pie). Chill for ten minutes. 3. Whisk together the condensed milk and cream, then add the lime juice and zest (it will thicken!). Pour onto your biscuit base and chill for at least 1-2 hours. 4. Remove the pie from the tin and place on a serving plate. Cut into slices and serve with the crème fraîche and lime zest. This Key Lime Pie recipe can also be made with lemons – replace the five limes with four lemons. For a lighter option and a softer set use whipping cream. Hi Liz, we reckon you're right! It's the acidity in the limes that set the dessert. Next time give it a go with more limes and it should work! I have made this recipe many times and is a firm favourite. So easy to do and the joy of the magic thickening always made me smile. Delicious. I like to make kiwi jelly on top with slices of kiwi embedded in the jelly. To really tart things up, make some raspberry coulis, mix in agar agar on the hob and pipette the hot mixture into oil that's been in the freezer for half an hour to create "caviar" spheres and rinse off. Decorate with these in the jelly concentrically around the kiwi slices. is it OK to make this 24 hours in advance? Hello A J, this recipe is the perfect dessert to make the day before. It will set beautifully in the fridge. First time I made this.Wow. So good. Hello Lesley, we're so glad that you enjoyed this recipe. Happy baking! My partner doesn't like digestive crumb base so I made this with a shortbread base instead, like on the millionaire shortbread recipe. Turned out amazing! I didn't believe it it would thicken after adding all the lime juice, but it just did! Like magic! Just wondered if you could make lime ice cream by using the same filling ingredients? Hello Barney, What a lovely twist to a favourite! We haven't tried making this into ice cream but we'd love to hear all about the results! This is a family favorite in my house! To prevent over indulging I slice and wrap individual pieces in grease proof paper and freeze them - discovered Key Lime P'icecream!! Hello Elaine, what a wonderful idea for your tempting extras! We haven't tried this in the Carnation kitchen but sounds delicious. Made this twice now second time added 1 lemon and family loved them both. Who needs bake off when you have these recipes, family think I have found a hidden talent. Shhhhhh! I made it and it is a favourite with my friends. Will be making again for them this weekend! I slice kiwi fruit and place around the top, adds the extra wow factor. I made this for my boss- it turned out perfectly! Phew! Thanks for a great and super easy recipe. This is so very fresh to taste and because the quantities are correct the base isn't too hard or too crumbly. Will be doing this a lot. This is a fab recipe - was really surprised to see no setting agent used. But the comments helped. Would have been helpful if the recipe had specified how long to beat the carnation milk and cream together. I used a had whisk for 5 minutes then folded in the lime juice and zest. it really did thicken "like magic". I used half gingernuts, half digestive and some extra spice. Worked a treat. This is so quick and easy makes a lovely refreshing yet sweet pie, and it looks so professional and tastes better love it! Have tried this both with lime and lemon wow taste with little effort. I wonder as it is the citrus element that thickens the filling could you use oranges as well? Hi Paul oranges have lower acidity than other citrus. For an orange flavoured cheesecake we recommend following the recipe as written but add the zest of 2 oranges instead of lime zest. I have just made this with lemons given by a friend-she wants some more! Delicious. Can I make this the night before or does it need making on the day! Hi Lydia, This can be made the day before. We recommend making the base a filling the day before and then whipping the cream and finishing the pie on the day. Hi Pikey so glad to hear we are making baking at home so easy. I was planning on making this pie tonight so it could chill overnight ready for a birthday meal tomorrow but I've realised I don't have any double cream only single will this do? Hi RJ, double cream is thicker and will give a better set to the pie. It's AMAZING especially with some dark chocolate grated on the top. Hi Debs, what a lovely twist on an old favourite! can you use Greek Yogurt instead of the cream? Hi Rachel, Greek Yoghurt will give you a very different taste and texture. We haven't tried this but it is certainly worth experimenting. The best Key Lime Pie recipe EVER... my most made dessert and never fails. I add the juice of 6 - 8 limes as I like it sharper. Nice decorated with piped chocolate shapes or candid lime peel. Made today in individual pots and frozen for Xmas dinner. Hope it's ok to freeze! I have a party on Saturday and want to prepare the key lime pie on Thursday and keep in the fridge - will it taste good ? Hi B, this key lime is wonderful treat! We always recommend you make it as close to the time as possible. If you need to make it ahead of time leave it in its tin and wrap it with cling film. Decorate at the last minute. I have tried this recipe lots of times with great success. Every time I visit my sister up country, she always asks me to make they Key Lime Pie. Oh nearly forgot to mention, try chocolate digestive biscuits for a change. Just made this with my mum! We used 160g of ricotta cheese and 140g of creme fraiche isntead of the double cream! to make it a little lighter! All other ingredients were the same. Excellent recipe and very easy to make! i found this recipe quite easy we have done this pie at school in our food technoly lessons and its really fun but also quite messy!we had to reduce the limes to 2 though,haha!lol.its so magical how the cream just mixes together-magic! I have made this recipe for over 30 years but we call it lemon thing, long before Key Lime pie became trendy! It is an old family favourite and now my daughters are making it! we make both lemon and lime versions for variety and it always works! I have made this key lime pie on many occasions it's easy and always a success. It tastes soooo good to. Hi Angela, we love this simple and reliable recipe! Hi Teresa, what an interesting twist. We love the pineapple idea! I made this using Lime and Lemons, it was an instant hit so I made it again and I shall make it again and again...love it! I have made this twice now as I love Key Lime Pie. However, both times it has not thickened when whisking as the recipe says "it will magically thicken" I have left it to set for 2 hours and it is edible, however not as thick as I would like or as the picture shows!! I have done exactly as the recipe says. The flavour is lovely it's just the thickness, any ideas on what I am doing wrong? Hi Wendy. We love this too! Our tip is to whisk your cream and condensed milk before you add the limes then just lightly stir the juice in and the acid will thicken up the dairy. It really is like magic! I made this today adding the juice of half a lemon (my limes were small) with dark chocolate spoons to eat it with. Watch this space for reactions when it's been tried. My mother used to make a jelly and whisk in Carnation milk and leave to set. I made it for my daughter and now she wants to know the recipe to make it for her kids. I can't find the leaflet it was in, can anyone help please? add the boiling water to the jelly and allow to cool (not set). Whip up the carnation evaporated milk till thick. Fold thorugh the cooled jelly and refridgerate till set. I made this today using 3 large lemons instead of limes and a packet of ginger biscuits. It was amazing. 7 adults ate the lot and there wasn't a crumb left. I will make this again without a doubt and will try the limes as well. Fab. Hi Karen, sounds scrumptious - what a lovely flavour variation! Top tip! How delicious Deborah! Sounds fab! Hi Jean, we can't guarantee the results - the acidity of the processed lime concentrates varies so always best to stick with the real thing! Hi, I was wondering how i would add coconut to the Key Lime Pie.....i didn't want the mixture to not set and also dont know what coconut to use? Hi Gillian, you can buy coconut milk powder (made by Maggi) from larger supermarkets - add 50g to the filling and beat until smooth. This way you'll still get the perfect set! Happy cooking! Is there an alternative to using double cream in this recipe? 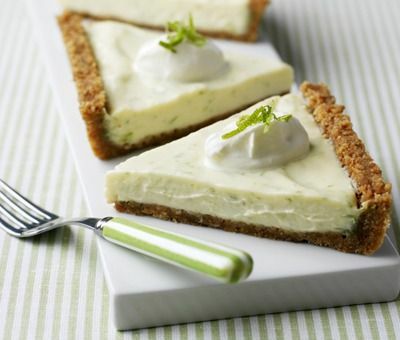 Hi Michelle, why not try our light key lime pie recipe if you want to omit the cream. In the normal recipe it helps to set the filling so we don't suggest a substitute but the light version is baked with egg yolks and has a meringue top - mmmm! I am having problems getting the mixture to thicken. In fact it just separates. I am following the recipe correctly. Does anyone have any advice please? Hi Sarah, not sure why it separates... Our advice is just to whisk it with a balloon whisk and so long as the ingredients are all fresh it should be fine. I have made this with ginger cookies in the base. Also I have made a gluten free version for my Dad using gluten free biscuits, works well. I have made this with out a base and frozen it and eaten it as icecream. I also added chopped ginger ( the type in syrup) ...it's delicious. I make this regularly, it's so quick & easy. All my family & friends love it! Has anyone made this and frozen it? Just wondering if it would freeze successfully. Hi Kerry, yes you can freeze this recipe for up to a month. However the base may be a little soft once you have thawed it. Freeze on the day of making and defrost in the fridge for 12-24 hours depending on your fridge. lOVE THIS RECIPE-JUST WONDERING IF IT IS OK TO FREEZE IT. , Hi Dianne, yes you can freeze this recipe for up to a month. However the base may be a little soft once you have thawed it. Freeze on the day of making and defrost in the fridge for 12-24 hours depending on your fridge. I've made this loads, it's foolproof and everyone loves it! Brilliant! It was delicious, but a bit too sweet - I think next time we should use less condensed milk, and more lime. We had great fun making it! i love this recipe its so good but could you add some sort of ginger and where would you add it ? Hi Anna, ginger works really well in this recipe - try replacing the digestive biscuits for gingernuts or chop some stem ginger (in syrup) and scatter over the set base before topping with the lime filling for a sweet gingery suprise! Awesome recipe and easy to make. I made the base with crushed Ginger Nuts instead and it went down really well! Really easy to make and soooo gorgeous. Yum, my new favourite dessert. A novice cook, I found this really easy and delicious. Can see this recipe being one of my go-to desserts. Hi Rashieda, we love it too! You can also make it with lemons - just swap the 5 limes with 3 large lemons! Yum! Have made it using bottled lime juice with no problems and bottled lemon juice. Made it with fresh Lime juice 1st time, all great. Made it with bottled lime juice the 2nd time and it wouldn't thicken. Must be something in the real limes that isn't in the bottled stuff. Whatever it was I shall only be using fresh limes from now on! Fab recipe. Key Lime Pie Recipe is rated 4.8 out of 5 by 51. Rated 5 out of 5 by Jaxo from Sublimely limey! Have wanted to make this for a long time, finally having the ingredients, gave it a go. Using coconut biscuits instead of the usual digestive made a complimentary combination. Made enough for six large portions and was received very well, even my son (an extremely fussy eating ex-chef) enjoyed it! Shall use lemons next time with a ginger base and see if it's another winning combination. Rated 5 out of 5 by Wimlambo from Delicious and very easy dessert I decided to try this recipe - I have always made the baked version before, for fear of the mixture not setting, but this uncooked version worked perfectly. I used ginger biscuits and coconut for the base, and I whipped the double cream into soft peaks before adding the other filling ingredients. The mixture stiffened straightaway, once the lime juice was added, and I put the whole thing in the freezer for half an hour before moving it to the fridge. It is thirty degrees outside, but two hours later, the dessert was perfectly set and ready to serve, decorated with chocolate hearts and lime zest shavings. A showstopper dessert, and no oven - perfect! Rated 5 out of 5 by JACK from Tasty pie this was easy, and I am only 9 years old so i would recommend this to every one that likes cooking. Rated 2 out of 5 by Krissiej from Not thickening? Hi. Just made this for a dinner party tonight, but it's not thickening when I whisk? Just consistency of a smoothie! Scared to put in bar as worried it will just be a drink on top of biscuit. Does it thicken once in fridge? Rated 5 out of 5 by artyju from Key Lime Pie to Die For I Made This Delicious Key Lime pie a few months ago , my Family Cold'nt get enough of this Zingy Lime pie , it's wonderfully Creamy but with the lovely freshness of The Lime too , The Crumbly biscuit base goes perfect with this too , It's a shame that I Never took , photos with regret . Rated 5 out of 5 by Haggis from Brill, so easy!! MAde this several times, quick and easy if invited to last minute dinner party , occasion and offer to provide the pudding. ALways gets compliments, light and refreshing after a meal and looks impressive, go for it you will not be disappointed ! Rated 5 out of 5 by bully from great taste i made this last week doing another today love it so tasty .